Today’s exercise targets the buttocks muscles, or glutes, which are often overlooked, despite their pivotal role in gait, coordination, and even relieving and preventing lower back pain. In fact, the glutes are the key to the distinctive human ability to walk upright. Weak glutes not only compromise your agility, but they can also contribute to a destabilized sacrum and sacroiliac joint, which is a major cause of lower back pain. So strengthening the glutes makes a whole lot of sense, and the Agility Enhancer does just that. Let’s get started! Your entire lower body is influenced by your glutes. When you walk, run, or do anything involving motion of your lower body, your glutes come into play. They stabilize your pelvis and propel you forward, helping you with balance and agility. Weak glutes cause other muscles to kick in and compromise in an attempt to do the glutes’ job. This throws your body out of alignment, unevenly distributing weight and causing muscle tightness and tension. Weak glutes cause these over-worked muscles to be more vulnerable to injury as well. Doing the glutes’ many jobs is no easy task for any muscle. The muscles in the buttocks are the largest and heaviest muscles in the body, but their power often goes untapped as the glutes are used more as “seat cushions” than the powerful muscles they are. The glutes’ power lies in their role in hip extension. Speed, acceleration, jumping, running, pushing backwards, and other fundamental movements all depend on hip extension, propelled by strong glutes. These twin muscles make the agile movements of runners and dancers possible. Many people do not realize the connection that exists between the buttocks and the back. They support each other, with the glutes doing the lion’s share of supporting. In the event that the glutes are weak, the deep psoas muscle, which runs from your spine to your legs, must activate in an attempt to stabilize the lower back. The psoas is not meant to take on this monumental task, so it becomes tight, compressing the lumbar vertebrae and raising the risk of compression fractures. In this state, the lumbar vertebrae can lose density because motion no longer triggers their full movement. And of course, a tight psoas muscle is more prone to injury and can cause significant back pain. When the glutes are strong and supple, the psoas can stop compromising and go back to doing its supportive role in the spine and pelvis, allowing the glutes to build bone density in your lumbar and sacral vertebrae. We’re going to look more closely at the connection between the glutes and the lower back – specifically, the sacrum – in a moment. But first, let’s look at how to do the Agility Enhancer. If you don’t have a carpeted floor, it’s a good idea to use an exercise mat for this move. Lie on your stomach and fold your hands in front of you on the floor. Place your forehead lightly on your hands, or turn your head to the side. Let your legs stretch out straight behind you. Bend one knee at an approximate 90-degree angle, keeping your toes pointed. With the knee bent, squeeze your glute and raise your knee off the ground a few inches, then lower it back down. As long as you are comfortable, aim for eight reps on each side for a total of 16 lifts. To round out your workout, try following up this exercise with another Weekend Challenge, the Hip, Glutes, And Femur Strengthener. This will give you yet another angle from which to tackle low bone density in your pelvis and lower back, particularly the sacroiliac joint. You may be unfamiliar with the sacroiliac joint of the pelvis. It’s the place where the sacral vertebrae join the pelvic bones, and strong glutes hold this joint in alignment and allow it to move effectively. What this means is that the glutes produce compressive force on the SI joint, thus transferring load between your torso and legs and building bone in this key area of the skeleton. Effective distribution of load is crucial for building bone density as per Wolff’s Law. So you can see how and why strong glutes are so vital for balance, agility, and motion. Of course, they are also crucial for building bone density in the hips and lower spine. 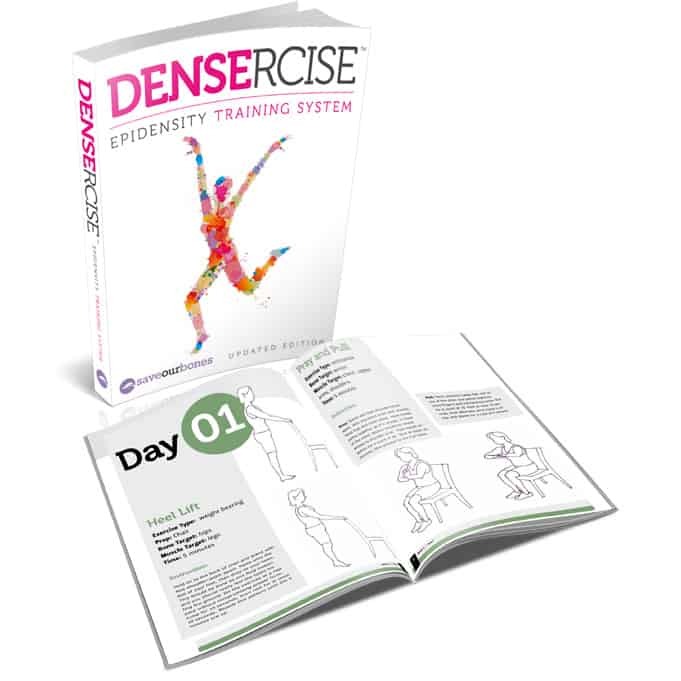 The Densercise™ Epidensity Training System acknowledges how important the glutes are in maintaining and reversing bone density. Many of its 52 moves involve these important muscles, such as the Dance Hop (page 39), Rear Leg Lift (page 40), and Side Lunge (page 16). With Densercise™, you can build density in all crucial areas of your body. Dear Vivien, your advices are splendid and you are for me the greatest person in the world, that is what I think . In the Agility Exercise only one hand is shown in the front and the other is under the abdomen, is this a modification? Pl. clarify. Thanks. Hi Vivian, I love all the information that you share with us. I was wondering about something, I just got out of the hospital 2 weeks ago with my third bowel adhesion surgery. Is there any kind of diet that you can recommend that can deter scar tissue formation in the bowel? Everyone that I ask says there is nothing that I can do – it is just something that happens. Any advice would be much appreciated. Try not eating any gluten. One of the problems that it helps with is osteoporosis. I also had been diagnosed with osteoporosis. I read an article that connected high liver values and osteoporosis with gluten sensitivity. I had had high liver values when tested for at least 30 years, and my medical providers could not figure out why. I decided to test myself very scientifically. So I had them tested again (they were, as usual, way above normal) and then ate no gluten for four months. I had them tested again and they were way down in the normal range for the first time in well over 30 years. I am assuming that my bones will also be getting stronger since a problem with gluten causes the little hairs that line our intestines to flatten and they become unable to absorb all the nutrients from our food. There are lots of gluten free foods available so it is very easy to do. You may also discover that other problems will go away as well. (I have read that the test for bone density is not accurate for people with either small bones or large bones. It also involves radiation.) We know people with Parkinson’s disease who are better when they go off gluten. We have a friend with multiple sclerosis who is Guatamalan. Her Guatamalan doctor advised her years ago not to eat wheat. She has lived a long time in good health by avoiding gluten. I met a physical therapist several years ago whose daughter was diagnosed with rheumatoid arthritis at age 10. After a year and a half of being given the drugs for that disease (which made her so ill that her teachers would make a pallet for her in the corner of the room when she felt too ill to sit at her desk), her parents found a specialist in food allergies to test her. She tested allergic to all cows’ milk and its products, gluten, and slightly allergic to soy. She was able to control the disease by avoiding all foods that contained them. It makes sense to me that if you are not absorbing all the nutrients from your food, it could cause, or be a part of the cause, of almost any disease. Is it OK to do this standing up – I have tried it slightly leaning forward holding on to something, bend knee backwards, squeeze glute and push backwards? probably not quite the same thing but I find it a bit easier plus I can get in several of them during the day. Sort of do a few if I’m in the toilets on my own for example holding on to the sink! Hi Vivian,can you tell me if the Dencercise videos are compatible in the U.K.
That’s great to hear, Shelly! And thank you for your feedback on a Weekend Challenge collection. 🙂 In the meantime, you can use the search feature above – just type in “weekend challenge” into the search box, and you can browse through them all. Keep exercising for your bones! I have osteoporosis . Presently taking Boniva. After 2 years my bone density numbers did not change. Not any worse nor better. Thanks Vivian for this wonderful information. The glutes are the very area that I really need to strengthen. I can’t lay on my stomach but I find by standing or also when lying in bed I will exercise that area by tightening up that muscle for about 10 to 15 reps on each side and hope that is helping me. I have Interstitial Cystitis and I’m usually up 4 to 5 times a night going to the bathroom to urinate. Our toilet seat, even though it is padded can cause pain in my glutes and thighs just from the repeated sitting on the toilet, so I need to have strong muscles in that area. When I recently had low back pain the many trips to the bathroom also aggravated the soreness in my hip, glutes and upper thighs. I’m sorry for rambling on, but this article is so helpful to me and even though I can’t do it exactly as shown here I can modify it to suit my condition. Thanks again. Hi, Carol—I have IC too. I’ve never run across anyone else on a post online who has it and I just wanted to say YOU’RE NOT ALONE. You DO know about the website don’t you? No need to apologize, Carol! Thanks for chiming in, and I am so glad to know that this exercise suits your needs.